ATR’s new Polaris RZR Cargo Rack height adjustable, quickly removable, and tilts up to access your spare or additional gear underneath. 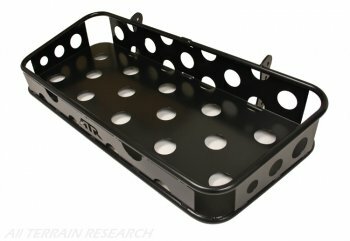 The Cargo Rack is adjustable from 9″ to 11.5″ in height between the RZR’s bed and the bottom of the rack. Cargo Rack uses ATR’s tube clamps to mount to the spreader bar behind the seats. The factory “lock and ride” mounting holes are convenient for some things, but not strong enough to bear the weight of items such as a loaded full size cooler or camping gear. A big advantage to this design is you do not have mounting feet going down taking up more room below the rack. ATR’s cargo rack allows you to effectively double the footprint of your bed storage area, and the tube clamp mounting is strong enough to hold just about anything you want to throw on it. 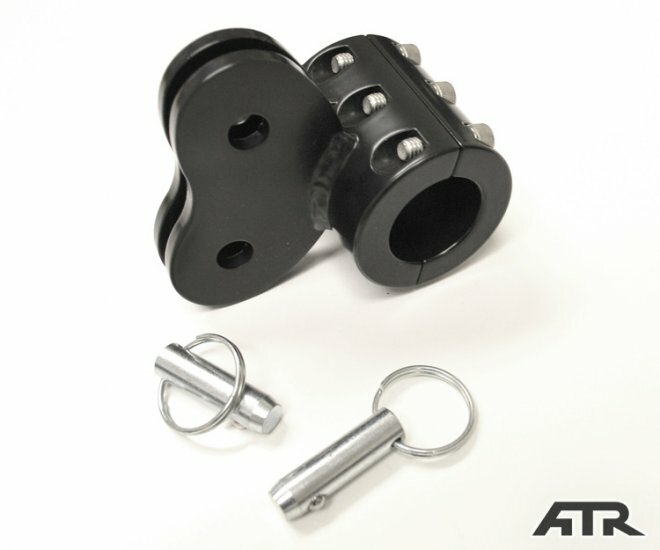 Once the tube clamp mounts are installed, the Cargo Rack can be quickly removed by pulling the 4 stainless ball pins. Also included is straps that secure quick release ball pins so they are not lost. ATR Cargo Rack comes in a durable black powder coat. Vote for UTV of the Year!